Calcudoku puzzle forum - View topic - what's next? A tutorial puzzle, of a difficult type with the possibilty to buy hints. - preferentially, the hint should be based on what you have filled in already, e.g. Maybe it is possible to device puzzles using with for example 5, 4, 3, 2,1, 1/2, 1/3, 1/5. Or maybe 1/2, 1/4, 1/8, 1/16. It was suggested already by someone in the past : 3D calcudoku. It seems difficult to me to device a practical viewer for this. Sorry to be negative but I don't like most of these ideas. I wouldn't do 2 player calcudoku. I might subscribe to a monthly magazine but with major ambivalence and I don't really think that it is needed. I don't like the buying hints idea. The division/fractions idea is interesting although I have a hard time imagining how it would work. Same for the 3D idea plus I'd be bad at it if it is doable. I do like interesting new types of puzzles. 15x15 and no-ops were very welcome additions. I liked the large cell puzzles that showed up once in the bonus puzzles and in one of the end of the year puzzles. Kozibrada had some very elegant user created puzzles. I imagine there are other clever ideas but they don't jump to mind. The monthly "magazine" (really a book) is the easiest and will probably happen. Does this mean $48.00 US per year for approximately 1200 points per year? There are 30 difficult puzzles at 8 points each = 240 points x 12 = 2880. Edit: could also remove the points rewards if people feel they have to buy the book for the points? I am sure that all users of your site appreciate the effort you make . You have created a wonderful puzzle domain and I, for one, enjoy every minute I spend here. Well almost every minute. I am sure you have other objectives in mind with the launch of your magazine and I will support you. I hope I can receive the forthcoming issues electronically saving you publishing money and all of us paper. 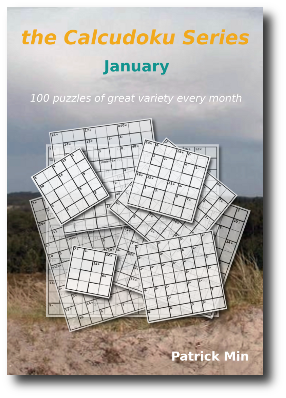 As I am approaching the completion of book puzzles in a very measured way it will take some time before I can submit the magazine puzzles which award points but that is neither here nor there. As I suspect for many I only do the puzzles which award points for my effort, this is both given the time I have to complete them but also in doing the daily puzzles plus the book puzzles I take enough pleasure. IAnd …. Have a great festive season. Last edited by frederick on Sat Dec 19, 2015 2:25 pm, edited 1 time in total.